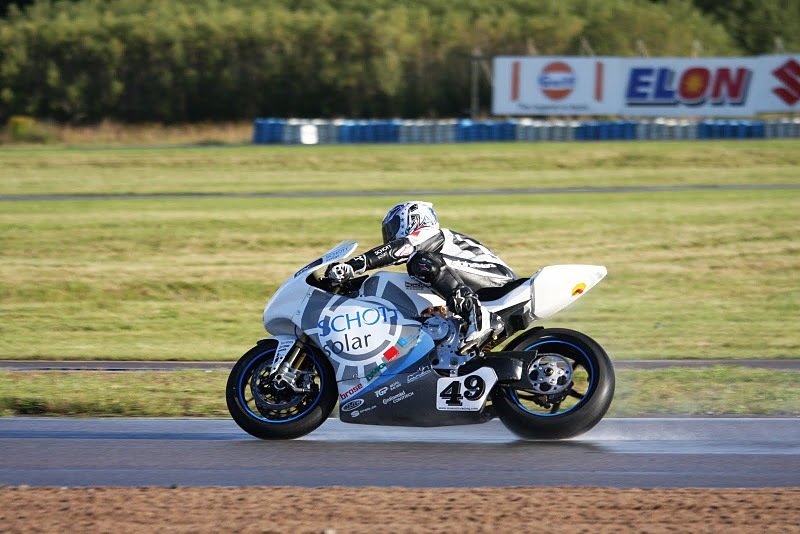 Himmelman leads from pole to finish the first ever Swedish TTXGP as the winner! The bikes lined up on the grid on a sunny afternoon to start the first ever TTXGP zero carbon clean emission race in Sweden. The current Euro Championship leader, Matthias Himmelman from Muench Racing led the grid from the start of the race with HoChi Fung from Zongshen battling to keep up with the German at the same time as trying to push away from his team mate, Tang Yu, but Himmelman was that little to quick and the gap was growing with every lap. It was yet just another extremely successful and impressive race for the Germans, with Mathias Himmelman producing lap times just seven seconds off the fastest lap time set by the 1000cc bikes and 4 seconds off the slowest 1000cc bike on the same day. To end the race in pole, having lapped 4th and 5th placed riders. Zongshen worked throughout the weekend to repair Tang Yu’s bike after he had lost control of his machine as he took the first corner in practice on Saturday. This didn’t seem to affect his bike as he managed to do enough to secure his podium finish in 3rd. Berix, just managed to make the start line, having been dogged by technical failures during the build, did not hold much hope for this race. The team had experienced problems with their machine throughout the weekend and resulted in them qualifying last on the grid. While the top three bikes pulled away, the battle had begun with the two Swedish riders. Mikael Nilsson, riding for Karlskoga Racing and fighter jet pilot Peter Linden, riding for Berix, found themselves battling each other for fourth place. Mikael Nilsson managed to set fairly consistent lap times, Berix struggled to maintain their performance and found the gap growing between him and Mikael. We look forward to what promises to be an epic finale to the TTXGP Euro Championship at Le Mans on 23rd /24th September. “If we cannot think of something it does not look that promising for us,” stated MUENCH driver Matthias Himmelmann shortly before entering the fourth TTXGP EU Championship race in Karlskoga, Sweden. The team decided to change the chassis frame settings and successfully completed the warm-up. With an improved lap time of 1.12 minutes the team was not only one second faster than before but was finally able to calmly approach the final race at 12.30 pm. For the final race both Zongshen team drivers HoChi Fung and Yu Tang, the Swedish homebound matador and jet pilot Peter Linden with his Berix Honda CBR 600 as well as Qualifying third place and local Mikael Nilson on his Mavizon joined the queue behind Himmelmann. David Hallet (Team Agni) was not able to race because of an unfortunate crash during the Qualifying that caused his e-bike to be heavily damaged. At almost summerlike temperatures of 22°C race started at 12.30 pm sharp. By that time no one knew that yet another premiere for MUENCH Racing Team was about to happen. Shortly after the starting line MUENCH driver Himmelmann and HoChi Fung raced alongside. Just before entering the first curve Himmelmann put all his talent and experience to a good use, delayed the braking and passed the Chinese. The two were closely followed by Tang, Nilson and Linden on his Berix Honda. Furthermore and with a time of 1:12,8 Himmelmann not only achieved the fastest lap time during lap three but set another time record for e-bike racing on asphalt. For the final laps the top 5 rankings remained the same and MUENCH Racing Team once again got to celebrate yet another great success –the team’s first start to finish victory! “During the remainder of the race I was not expecting the lap times to be that good. Even though I reduced the power supply and only wanted to keep the distance I achieved lap times around 1:13. The MUENCH TTE-2 clicked like clockwork! With his preparation and the adjustments he made Thomas Schuricht, our Head of Development, really achieved an excellence,“ said Himmelmann after the race. Now, Fans can be really looking forward to the last race in LeMans on September 23th. A race, that will not only decide the TTXGP EU Championship but will also nominate the FIM e-Power World Championship’s participants. Additionally all racing fans get to watch another highlight- the fight for the legendary 24 hour Motorbike World Championship crown. Considering the TTXGP EURO Championship standings Himmelmann leads the field with 75 points followed by HoChi Fung (China, Zongshen, 56 points), Alessandro Brannetti (Italy, eCRP Racing, 45 points) and David Halle (UK, Agni, 40 points). Looking at the FIM e-Power Championship standings team MUENCH also places first with 55 points. Team eCRP (36 points) and team LNG Racing(16 points) currently rank second and third. TTXGP goes all Nordic for its first outing in Sweden. The Swedish leg opening with a bang with David Hallet on the Agni crashing in the practise. With support from Zongshen, he returned to qualify only to fail with a mechanical failure. Muench continued to create records by being only 7 secs off the fastest time set by 1000cc Superbike and an incredible 4 secs off the slowest. The team was confident on being able to close the gap but played a conservative game! Team Berix after a number of false starts, made up for it with a best lap of 1.27.716 so will be in 4th for the qualifying start of the race. Teams Karlskoga saw the return of a Mavizen TTX02, ridden by local hero Mikael Niksson. Team AOS fielded both riders in the race. "This is my first time in Karlskoga. The Muench bike is very heavy, so this track can be very tricky and can be very difficult to ride the bike fast. On some parts of the track it’s like a Motorcross Circuit. I feel that i have learnt the track and all its corners. Myself and the team are very pleased with the times being set in the first dry practice session. We will make further adjustments to the suspension and sprocket in hope to set faster lap times in tomorrow’s warm up session. It’s a hard job riding the Muench bike here but also very enjoyable. However, it has to be said, that we, The Muench Team are missing our Italian friends, CRP Racing." "My bike for the moment is embarrassingly slow. We have experienced a lot of problems with the bike this weekend but the team will be working around the clock to resolve some of these issues. We are certainly happy that we got the bike running. Our goal for tomorrow is to make sure the bike completes the race. I do feel that I will drop a lap compared to the faster machines on the grid because of some of the issues that we have. If the bike completes the race then me and the team will certainly be happy with that. We are using the time at Karlskoga as a learning experiencing, to understand the bike, to find new ways to improve both handling and speed. I must say the handling is just incredible. It is superb on how I can just throw the machine into the corners, however saying that, I did almost loose the front end in one of the corners"
The fourth round of the TTXGP Euro Championship will take place at the Karlskoga Motor Stadium, Sweden. With two rounds to go, the top 4 teams are separated by only 14 points.